This is the first blog post in a series about the migration and new plans of my hackerspace alma mater – Kiberpipa / Cyberpipe. In this post I hope to quench the thirst of many people by explaining shortly where Kiberpipa is now and how we got there. Later in the series I plan to write more about the current community, its goals and ideas … stay tuned! Well, I am extremely happy to let you know that we have a signed lease contract, have already moved into our new home and have almost finished with brushing up the place! Update: We moved again. More on that in a later post. Not only is this literally just around the corner from our previous address, but the location is much much better as well. For starters, we are located in a gallery of one of Ljubljana’s most iconic buildings: Tavčarjeva palača – commonly known as Palača/Kavarna Evropa. Apart from some shops, apartments and a café, this building also houses Ljubljana’s main public library – Knjižnica Otona Župančiča. This combination gives us a visibility that we could only dream of in our previous (admitedly large) basement! And when the full-length glass wall of our ~47 m² ground floor is too much, we can just move to the privacy that our windowless ~47 m² first floor offers. Since some of the main reasons for the liberation of Cyberpipe was to gain more independence, the more important question is that of our legal status. We are proud to say that we are now part of LUGOS – an NGO/NPO that was one of our founders way back in 2001. Cyberpipe and LUGOS have from the very start maintained a fruitful cooperation on several projects. Inside LUGOS, Cyberpipe has a separate bank account and has a substantial autonomy. This symbiosis has spurred a lot of positive vibes and activity in both groups. It was quite a long and bumpy ride, but I will try to keep it short. For more details, you can ask me or any of the other migrators in person. And the inspiration is not only visual. 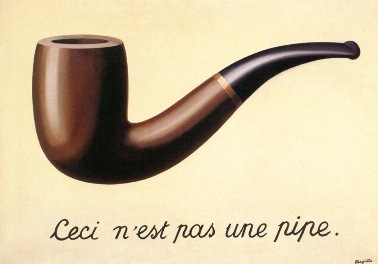 The text below the Magritte’s pipe says « Ceci n’est pas une pipe. » – indicating that this (image) is not a pipe and that claiming that it is a pipe would be deceiving. What it is though, is a manifestation of a pipe. The very same can be said about Cyberpipe: Cyberpipe is a concept and every physical manifestation of it is just that – a concept, nothing more and nothing less. So what we have here now is not a new Cyberpipe, but just a new manifestation of it – the location and people may change in time, but the idea(l) stays the same. The wish for (more) independence was present for a very long time and cannot be attributed to a single one moment in time. The fact that we were told to move out of our basement on Kersnikova 6 was just the final trigger for getting off of our arses and moving out – much like a child that grew up – instead of just moving next door. So in summer of 2013 we parted our ways in good (and written) terms with Zavod K6/4 – part of which we were from 2001 – and started looking for a new home. For months many of us were scouting the city centre (and a bit outskirts) for an affordable and acceptable new location. We met many supporters, but very few options – none of which were realistic for our survival. It was a very frustrating time, but as individuals we learnt a lot and as a community we grew tighter. I will skip all the possibilities that we got offered and did not work out. But would at this point like to thank everyone who offered help, even if in the end it worked out otherwise. Our luck changed when we got invited3 to Studio City, where Marcel Štefančič jr. interviewed Andraž “minmax” Tori and myself regarding the future of Cyberpipe on the national television. The gist of our message was that we just need a place to work in and we will handle the rest ourselves. scouting the area over and over again. …but while we were doing that, my dad was constantly nagging me to go and ask the city public library, stating that if anyone, they would be a good partner. Hey! I know this is a long shot and the answer will probably be “no”, but do you have any idea where we could find a space for a hackerspace? Not at all, let’s figure out something. Skip ahead a few months, and what came out of that discussion is an awesome location and a cooperation contract with the Ljubljana city library! But freedom comes at a price – in this case very literally! When we left the previous place, we took with us very little equipment and no finances at all. Now that we have our own place, we also have to pay rent for it as well as standard costs of heating, internet etc. So I am hereby humbly asking you to please support Cyberpipe by financial, material or other means. It was a long and thorny journey and without mutual support and optimism, we would never have made it this far! My hat is off to you, my fellow “pipci in pipke”4 – it is an honour to be in your midst. During the year of migration and even before, too many people have helped us to list here. You know who you are, so hereby please accept our eternal collective gratitude!